stealing and committing adultery and deceiving each other. Is not this, Euthyphro, the reason why I am being prosecuted, because when people tell such stories about the gods I find it hard to accept them? And therefore, probably, people will say I am wrong. Indeed, Euthyphro, this is the reason why I am a defendant in the case, because I find it hard to accept things like that being said about the gods, and it is likely to be the reason why I shall be told I do wrong. ...the awesome [mysteries], which one can neither transgress nor inquire about nor broadcast; for great awe of the gods stops the voice. Blessed is he of men on earth who has beheld them; but he that is uninitiated in the holies or has no part in them, never shares the same lot down in the musty dark when he is dead. Hymn to Demeter, 478-482, The Homeric Hymns, Homeric Apocrypha, Lives of Homer, translated by Martin L. West, Loeb Classical Library, Harvard University Press, 2003, pp.68-71, translation modified, with some alterations based on The Homeric Hymns, translated by Jules Cashford, Penguin Books, 2003, pp.25-26. neither speaks nor conceals but gives a sign. If the view of the impious guilt of Socrates is now "widely accepted," then everyone is making a serious mistake. Burnyeat does not make his case in a convincing or definitive way. His argument relies on ignoring some key passages and context, a mistranslation, and some dubious, or transparently false, interpretations. Myles Frederic Burnyeat (b.1939) has taught at University College, London, Cambridge University, and Oxford University. In 2006, he returned to Cambridge, where, if he is still active at 79 years of age, he apparently remains. He has taught Classics and Ancient Philosophy and was president of the Aristotelian Society (2005-2006). A Dictionary of Surnames, by Patrick Hanks and Flavia Hodges [Oxford University Press, 1988], has no information on the surname "Burnyeat," which I have not otherwise encountered. So Myles Burnyeat has been an academic and scholarly heavyweight for some time. This does not excuse, however, his failures to attend to the text, to understand the logic of the argumentation, to be conscious of general facts about religious practice, or for what even seem to be modern biases against his subjects, Socrates and Plato. Burnyeat has some personal investment in the guilt of Socrates, as an enemy, with Plato, of Greek religion, despite the certainty that he does not practice such religion himself, if any -- the opposite of Erasmus famously saying, "Pray for us, St. Socrates." So we may be left wondering what this is all really about. My considerations here begin with the epigraphs above. The famous statement by Xenophanes of Colophon, that "Homer and Hesiod have attributed to the gods everything that is a shame and a reproach among men," serves to demonstrate that the moral critique of Greek religion, or Greek mythology, begins long before Socrates or Plato. And no one, to my knowledge, ever accused Xenophanes of impiety. Instead, the prosecutions of philosophers at Athens -- Anaxagoras, Socrates, and Aristotle -- were all much more politically than religously motivated -- Anaxagoras as a friend of Pericles, Socrates associated with sympathizers or quislings of Sparta, and Aristotle himself a Macedonian. On the other hand, an Athenian who might have been accused of disrespecting the gods, by asserting that they have a selfish disregard for human welfare, namely Euripides, did occasion some grumbling, and a satyrical play by Aristophanes (the Thesmophoriazusae), but we never hear of any prosecution of him ever being considered. Instead, he was a properly celebrated playwright and even remained the most popular of the tragedians among Christians in the Middle Ages -- probably one reason why Nietzsche (or Burnyeat?) grouped him with Socrates as a corrupter of the Greek spirit [note]. So what kind of trouble was Socrates liable to get into merely for agreeing with Xenophanes? Was there a creed or dogma of Greek religion holding that the gods must act immorally, or a forthright apologetic to that effect (before Nietzsche)? Certainly not. Nevertheless, Socrates tells Euthyphro, as we see above, that his views about the gods may get him convicted in court. Burnyeat would second this with, "And rightfully so!" Yet Burnyeat does not cite this instance of self-awareness by Socrates. We might wonder why not. After all, if the objection of Socrates is to those stories, or to the poets (like Xenophanes), then it would not make any sense if he simply didn't believe in those gods anyway. Why worry about them being insulted if they don't exist? Indeed, why not. But Socrates is not accused of disbelieving the poets. He is accused of impiety by , "not believing [ou nomízonta] [in the] gods whom [theoùs hoùs] the city [hê pólis] believes [nomízei] [in]" [Apology 24b, bracketing the English words that do not correspond to words in the Greek text]. Thus, Burnyeat wants to make the case that, whatever gods or God Socrates believes in, they are not the gods of Athens. So he is guilty as charged, and we are favored with the information in the article that where Burnyeat gave his talk, he persuaded much of his audience of this. So we shall see how well justified the verdict was. This is the thesis of Burnyeat in detail, and perhaps it is the basis of the whole business. But it is the only place in either the Euthyphro or the Apology where we get this; and when we turn to the Apology, the actual indictment by Meletus, and what he has to say in Court, do not assert the same things. Socrates is indeed accused of not believing ( ) in the gods of the city, but what he is said to introduce instead is not "new gods," , but something that is vague and ambiguous, as we will see, which is why Socrates cross-examines Meletus to understand what he means. Burnyeat acts as though the actual indictment of the Apology says what Socrates relates here in the Euthyphro, and he ignores the ambiguity of the real charges and the logic of the situation that motivates Socrates to ask the questions and demonstrate the conclusions that he does. Even worse, Burnyeat ignores what Meletus actually says in Court, which is that Socrates believes in no gods, either new or old, and is no more than an atheist, like a lot of Greek philosophers and sophists. It obscures the issues greatly not to keep all these currents clear and separate. We are properly left to conclude that the ambiguity of the indictment conceals the belief and the desire of Meletus to accuse Socrates of atheism, a dimension that is off the map in Burnyeat's analysis -- despite the reliance on it of the whole cross-examination of Meletus by Socrates. And...despite the preference of many modern academic philosophers to just assume that Socrates was an atheist and that all this business about the god and Delphi is just an ironic pose -- i.e. a lie. This makes him, what? admirable? Perhaps in recent academic culture, where there is no truth and lies serve to demonstrate (Nietzschean) power, but not in terms that have ever been familiar to anyone else. Not even to Myles Burnyeat. In his treatment, Burnyeat gets off to a bad start. Not in the main text, which is reasonable enough. Plato's Apology was obviously written by Plato, and reads like it. So Burnyeat proposes that we address Plato's presentation and not worry about the historical Socrates. However, in a footnote, Burnyeat then simply dismisses information from Xenophon, : "We need not believe... Xenophon's statement (Apol. 4) that Socrates was prevented by his 'divine sign' from preparing the defense beforehand." Why not? We are not told. Perhaps this is in line with Burnyeat's determination to address Plato's Apology and ignore questions about the historical Socrates. However, in those terms, he does not need to consider Xenophon at all, much less curtly and opaquely dismiss his information. And this is a bit disingenuous, since the title of Burnyeat's article is "The Impiety of Socrates," not "The Impiety of Plato's Socrates." The reader is left with a first impression that the discussion has something to do with the historical Socrates. Indeed, it is hard to read Burnyeat's article without drawing conclusions about the historical Socrates -- and obviously, if Plato believes this about Socrates, that he did not believe in the gods that the City believes in, then his belief and his presentation is about the historical Socrates. Indeed, that is what Rebecca Goldstein said, that Burnyeat promotes "the now widely accepted view that Plato represents Socrates as guilty as charged," clearly meaning the historical Socrates. This is different from the status of "Socrates" in much of the rest of the Platonic corpus. When we see in the Apology that Socrates could not find anyone who was wise, which vindicates the oracle of the god, and then in the Meno and Symposium that he had indeed talked to "wise men and women," [Meno 81a], we know that Plato altered the persona of Socrates as he developed his own ideas -- even as, strictly speaking, the existence of the "wise men and women" would falsify the oracle's answer about Socrates. Whether arguing intentionally and honestly or not, Burnyeat's treatment is bound to leave an unrestricted sense about Socrates, which means we should pay some attention to Xenophon's information. As I will. Even confining ourselves to Plato's Apology, however, Burnyeat ignores an explicit statement on the very first page: "but you will hear things said at random [ ] with the words that happen to occur to me" [Loeb, p.69], or "but things spoken at random and expressed in the first words that come to mind" [Grube, p.24]. If Socrates had not prepared a speech, nor even thought about it, this is what he would say. And if he did not prepare a speech, or even think about it, as Xenophon relates, why not? Ordinarily, someone facing trial would do one or the other; but we know, from the Apology itself, that Socrates's voice often stops him doing something right in the middle of doing it. The most reasonable explanation of Socrates's lack of preparation, even in the absence of Xenophon's testimony, is thus that his voice stopped him. In those terms, it is superfluous for Burnyeat to consider that the cross-examination of Meletus could not have been prepared ahead of time (as he does in the same footnote). No, it could not; but Socrates tells us, in effect, that he prepared nothing and is speaking off the cuff. Why can Burnyeat not take that into account? Indeed, if the whole speech of Socrates is "random," then it is silly to consider whether the cross-examination of Meletus could have been prepared in advance. But Burnyeat does not get into real trouble with his thesis until the third page of the article. Here he gives the "exact charge," of "corrupting the youth and not believing in the gods ( ) which the city believes in but other new divinities ( )." Trouble. The word is not "divinities." It is an adjective, "spiritual," in the neuter plural, agreeing in gender, case, and number with the other adjectives in the phrase, namely , "new," and , "other." As is allowed by Greek grammar, there is no noun in that phrase. Nevertheless, Burnyeat is not alone with this problem. The Loeb edition says "new spiritual beings" [p.91]. and Grube says, "other new divinities" [p.29]. They all miss the ambiguity of the phrase, which should properly be translated "new spiritual [things]." This is a distinction that makes a big difference. It is because of the ambiguity that Socrates asks Meletus what it means (at 26b). If simply meant "divinities," then it would make no sense for Socrates to ask if Meletus means that Socrates does not believe in the gods of the city, or in gods at all; and the subsequent argument, that implies , "spirits," would be redundant and unnecessary. The very ambiguity of "new spiritual [things]" occasions the question, the argument, and the logic of both -- as, indeed, someone might wish to say today that the existence of "spiritual things" (perhaps in relation to nature) does not imply the existence of spirits, gods, or God. The modern person saying, "I'm so spiritual" doesn't mean that they believe anything in particular, let alone an identifiable faith. In each of these cases, Socrates contrasts the adjectival nature of one with the nominal nature of the other, with emphasis by the addition of an actual noun, , "affairs" (compare Chinese ), to accompany the adjective. He then does the same thing to ask if , "spiritual affairs," does not imply , "spirits." Meletus must agree that it does. Yet every translation I have cited, including Burnyeat, translates as though it is a noun [note]. All this requires careful consideration and attention. To summarize: cannot be translated "divinities," because it does not and cannot mean that when Socrates says , "spiritual affairs." Also, if means "divinities," then it already means , "spirits," the accusation of atheism by Meletus is absurd, and the entire line of questioning pursued by Socrates is unnecessary. The whole context and logic of the passage, meaning the reason why Socrates even asks the questions that he does, and what he wishes to demonstrate, must be ignored by those, the vast majority, who mistranslate . This is not a trivial point in the present examination; for if Socrates is originally accused of introducing "new divinities" (as we saw recounted in the Euthyphro), then a large part of Burnyeat's argument is made for him. But if the accusation is ambiguous and indefinite, then it must be clarified. And this is what Socrates does; for the question that Socrates first asks is whether this means or implies that Socrates believes in any gods or, presumably, if is supposed to mean something else entirely (as now it might). The result is a key admission from Meletus: "That is what I say, you do not believe in gods at all" [26c; Loeb, pp.98-99]. This confirms what Socrates said earlier (at 18c), that people have the impression that philosophers "do not even believe in gods." Now Meletus says so, and Socrates can nail him with the implications of his own charge -- implications that would not even be "implications" if already meant "divinities" -- and Burnyeat uses without noting, or explaining [p.4], that this is a different word from , thus skipping over the problem that neither the indictment nor Meletus has happened to accuse Socrates of introducing "new divinities." This exchange shifts the focus of the Apology in a key way, since it reveals that Meletus doesn't really care about the charge of "not believing in the gods which the city believes in," but that what is behind the indictment is the belief in the atheism of Socrates and other philosophers. But Burnyeat does not want to allow that this passage makes any difference, even as it explodes his whole thesis. To Burnyeat, even if Meletus admits that Socrates believes in gods, it does not mean that Socrates believes in "the gods which the city believes in." But that is old news after this point in the Apology; and there is no foothold for the notion that Socrates believes in other gods and that Meletus, the jury, or Plato care about any such thing. They don't, and Burnyeat ends up with an investigation and an argument that are irrelevant to the text and to what Socrates and Meletus are addressing. So, despite Burnyeat, this is obviously not a distinction, between these gods and those gods, that matters to Meletus; and if the jury believes Meletus, then no other hair splitting is necessary. Socrates has got the essence of the matter, which is the reputation of philosophers for atheism, not the reputation of Socrates for having different gods from the city -- which is actually not the case anyway. And so Burnyeat tops off this train wreck by saying, "Nowhere in the Apology does Socrates say he does believe in the gods the city believes in" [p.3]. For it is plain that if by persuasion and supplication I forced you to break your oaths I should teach you to disbelieve in the existence of the gods and in making my defense should accuse myself of not believing in them. [Loeb, p.127]. 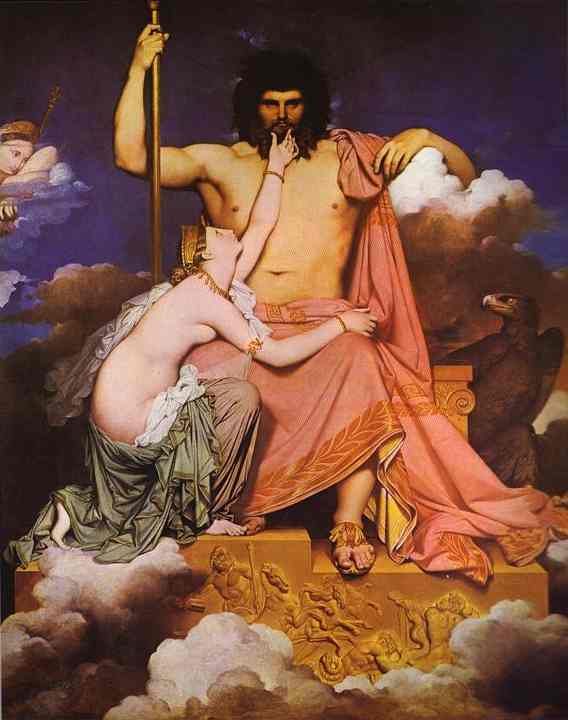 Now the oath sworn by the jury certainly was to "gods the city believes in," and these are the gods, in context, that Socrates is talking about, both that he would need to not believe in to get the jury to foreswear their oaths, and that he does actually believe in, , literally "as none of my accusers." Later, I will consider further Burnyeat's interpretation of this expression, and why Socrates has added it. Burnyeat makes it a key point that Socrates "never speaks of Apollo by name." He wants us to consider that "the god," , whom Socrates is constantly invoking is not Apollo. Since Apollo "is one of the gods the city most centrally believes in," Burnyeat's case is shot if Socrates actually means Apollo, and he knows it. So his work is cut out for him. However, Burnyeat's argument is not going to work. Xenophon identifies Apollo by name as the god of Socrates. But, evidently, we "need not believe" Xenophon, who only knew Socrates personally, and we can ignore ex hypothese his evidence. On the other hand, Socrates introduces "the god of Delphi," , as his witness [20e]. Now, "the god of Delphi," is Apollo, and everyone knows it. What other god could that be, unless Socrates has himself made up an entirely new god to be "the god of Delphi" rather than Apollo? We have no indication that Socrates did anything of the sort. Similarly, when Socrates asks "What in the world does the god mean..?" [21a], he is speaking of the oracular response given by the Pythia, whose extraordinary possession, if it was by some god other than Apollo, would have been astonishing news to everyone [note]. And to Burnyeat's "Ah, ha!" that Socrates never names Apollo, we have the circumstance that Socrates also never names Achilles, even though he talks about him, as Burnyeat appears to acknowledge, and otherwise freely names Hector and Patroclus. Instead, Socrates identifies his hero as "the son of Thetis," [28c]. Presumably, Socrates has not made up a new unnamed hero, like his new unnamed "god of Delphi," to also be "the son of Thetis." Burnyeat only mentions Thetis to note that she was not "one of the gods the city believes in" [p.4] and has no bearing on his argument. But Socrates never names his "demigod," , Achilles any more than Apollo -- something Burnyeat seems to have missed. Similarly, Socrates also never names his own wife (Xanthippe), or even mentions that he has a wife, despite a reference to his three sons [34d]. Presumably, Socrates had not gotten the sons "of an oak or a rock," and does not mean that he has some other wife, whom the city does not recognize. Instead, we have every reason to believe that Socrates is observing a delicate scruple about mentioning respectable women in public. If Socrates is not deliberately deceiving us about his beliefs, then why the reticence about naming his god and his demigod hero? I have already discussed this in some detail elsewhere. But let's begin with Homer, who refers to an unnamed "goddess," , in the first line of the Iliad [Homer, The Iliad I, Loeb Classical Library, Harvard University Press, 1924, 1988, p.2]. If Homer is as evasive as Socrates, for the same reasons, then he is dishonestly concealing some heterodox theological commitment. Of course, Homer is not being evasive at all. He is observing a convention common to many of the world's religions, that you do not directly name the deity with whom you are the most concerned. The most striking example of this, of course, is in the Hebrew Bible, where consonants of the Name of God are given, , but not the vowels. The Name of God is not vocalized, and devout Jewish practice is to refer to God as , Ha Shêm, "the Name," and to even write the word "God" without the vowel, as "G-d." The Name of God was only spoken once a year, in the Temple in Jerusalem, a practice discontinued and forgotten after the destruction of the Temple in 70 AD [note]. An epigraph to this very page (and which we have seen in Note 1), by Heraclitus, refers to Apollo without naming him, as the "the lord [ , a very archaic term; wanax, with the lost diagamma, in Mycenaean Greek] whose oracle is in Delphi." Perhaps Heraclitus was part of the conspiracy with Socrates to change which god is at Delphi. Meanwhile, we encounter another unnamed in Parmenides, who is guided and instructed by her in extensive hexameter verse [cf. G.S. Kirk, J.E. Raven and M. Schofield, The Presocratic Philosophers, 1957, Second Edition, 1983, 2004, Cambridge, p.242]. Since Parmenides is probably not possessed, like the Pythia, or channeling a spiritual entity, he is using his anonymous goddess as a device of tradition, a tradition that consequently was not something unique to Homer. As for who this goddess might be, we have few clues. Thus, the "silence" of Socrates about the name of his god is not some kind of dishonest evasion and a clue to his impious guilt, but a mark of the very reverence in which he holds that god -- a reverence that Xenophon illustrates at some length. Such scruples of naming are not generally observed in Greek religion, but they are there -- as we have just seen in Homer and Parmenides. There are so many ways to refer to various gods, with epithets, like , that avoiding their precise names imposes no difficulties. What is unusual about Homer or Parmenides is that they give us no hints who their "goddess" is going to be -- although some texts of the Iliad have "Muses," , instead of "goddess," which puts us in the ballpark. Nevertheless, with M.F. Burnyeat we have no indication that he is aware of these kinds of ritual or pious conventions; and if Socrates clearly means Apollo by his locutions, it simply destroys Burnyeat's argument. Which consequently is indeed destroyed. But this is not the end of the problems with Burnyeat's treatment. Burnyeat also wants to get some mileage out of the circumstance that Socrates "does not say he does believe that the sun and moon are gods" [p.4]. But if Burnyeat wants to say that Socrates doesn't believe they are gods, this is against the logic of the whole passage. Socrates begins by asking Meletus, as we have seen, whether he is accusing Socrates of not believing in the gods that the city believes in, or if Meletus is accusing him of not believing in gods at all. Meletus has his chance to strengthen Burnyeat's argument by affirming the first alternative, but instead, he confirms the suspicions already voiced by Socrates by affirming the second alternative and openly accusing Socrates of atheism. Socrates then elicits from Meletus the next thing he expects, which is that Meletus will attribute to him the kinds of theories suggested by the natural philosophers, in this case the suggestions of Anaxagoras that the sun is a hot stone, and the moon earth. Now, we already know, and Burnyeat has allowed it, that Socrates is not interested in the natural philosophers and that he does not ask people in the marketplace questions about astronomy or cosmology. So if Meletus doesn't know this about Socrates and is not famliar with the rejection of natural philosophy by Socrates, where does this leave Burnyeat? With Meletus, it would seem. For the conclusion of Burnyeat appears to be that Socrates agrees with the natural philosophers after all and views the sun and the moon as natural objects, not gods. This puts Burnyeat squarely in the camp of Meletus, that Socrates is an atheist, like a lot of the natural philosophers. But then, Burnyeat's thesis supposedly is that Socrates isn't an atheist, is it? Perhaps he got carried away. So the question asked by Socrates, about whether he, like other men, does not believe that the sun and the moon are gods, is, according to Burnyeat, designed to deceive, giving the false impression that Socrates is indeed "like other men" in his belief, while Meletus (and Burnyeat) has seen through his sophistry. However, Burnyeat's tissue of misdirection is exploded by the final comment of Socrates in the matter, that these theories are "absurd," ("out of place, strange, unwonted, extraordinary, eccentric, unnatural, disgusting, foul," literally "placeless") [26e]. So now, according to Burnyeat, Socrates is going to believe "absurd" theories just because he doesn't pause to give us his explicit confession that the sun and the moon are gods? Otherwise, he goes along with the Presocratics, contrary to Burnyeat's previous stipulation, in all their naturalistic theories? I don't think so. This exercise adds nothing to Burnyeat's case except an impression of the violence he does to the text, and perhaps even confusion about what his own argument is supposed to be. But Burnyeat is confusing two different things. Socrates does not question "the accepted values of the Athenian community." On the contrary, he reproaches people for not living up to them, and for not even knowing what they are. Thus, in the most dramatic fashion, we have Socrates, uncharacteristically, as a member of the Council, the , Boulé (selected by lot), refusing [32b] to allow the Assembly to break the law by trying together the naval commanders from the Battle of Arginusae (406 BC). Now we would call this upholding the principle of the Rule of Law, in the interest of simple justice, as is often the case. When Socrates asks individuals what they are doing, why they are doing it, and on the basis of what values they are doing it, he is not urging them to become nihilists or to betray the city. He is calling them to be concerned for their own virtue, and their understanding of it. His objections and cautions about the government of Athens are not that the city and its values are bad, but that those charged with the government are bad, corrupt, and direct matters to their own interest rather than the good of the city. Hence, the city needs its "gadfly," , to sting and rouse everyone to a consciousness of their duty. And since Socrates only asks questions, and never tells people what to do, he can hardly be in the business of introducing a whole new system of values for Athens [note]. Burnyeat can be right that the Apology is an accusation against the Athenians but at the same time wrong that it is an accusation against Athens or its "accepted values." No Athenian was seriously going to argue that the "accepted values" of Athens were corruption, injustice, lies, and self-seeking -- such as Socrates discerns in his own accusers. In "resisting the call to virtue" made by Socrates [p.6], Athenians were violating "accepted values," not promoting them. Even poor, clueless Euthyphro, who will suffer from Socrates's questions, sees Socrates as a local institution, whose prosecution will harm the very "hearth," (Loeb and Grube both say "heart"), of the city itself [Euthyphro, 3a]. Burnyeat disagrees. Burnyeat argues that Socrates does not "share the religion of the Athenian people" and that the Athenians should say, "Socrates has a religion, but it is not ours" [p.6]. But that was not the question. Socrates may see the gods differently, but is he guilty of "not believing [in the] gods whom the city believes [in]"? No. Really, Burnyeat's complaint is not against Socrates, but against Xenophanes -- who, of course, is never mentioned in the article, despite the movement he represents, with Heraclitus and others, of the moral critique of Greek religion. So what? In terms of Burnyeat's own argument, it is irrelevant to the question, since believing "in a different way" does not necessarily mean not believing, which is the accusation. We can indeed see the phrase , "as none of my accusers," as ambiguous. It can mean that the accusers do not believe as Socrates does in, say, the justice of the gods, as Burnyeat has it; or it can mean that the accusers are guilty precisely of that which they accuse him, namely, not believing in the gods at all. The context tells the tale, as we have already seen. The justice of the gods, or anything else, is not the issue in the passage, but their existence. Socrates will not ask the jury to foreswear their oaths, which are to the gods of the City; and he will honor the oaths, because he honors those gods and believes in them, as none of his accusers do. Since Socrates believes that his accusers know that they are trying to have a man executed unjustly [30d], he thinks they cannot have any fear of the gods. It cannot be the case that, without fear, they actually believe in the gods -- or they would fear punishment, as well as being "ashamed before men." Of course, by the way, the passage from the Euthyphro also illustrates the concern of Socrates for the "accepted values" of Athens, namely the respect owed by sons to their fathers -- which figures in the Euthyphro as the problem of Euthyphro's own impiety. This passage thus contradicts the thesis repeated by Burnyeat at the bottom of page 7: "I have argued that Socrates' god demands a radical questioning of the community's values and its religion." With this in mind, Burnyeat himself continues to an explicit consideration of the Euthyphro. Burnyeat cites "the standards of the old religion, strongly -- even fanatically -- supported by Euthyphro" [ibid.]. This is quite false. Euthyphro is a fool, not a fanatic. To contemporary readers, and to Socrates himself, the most shocking thing about the Euthyphro is that Euthyphro should be prosecuting his own father for anything, let alone on a confused murder charge, whose merits Euthyphro himself is unable to explain very well. In terms of Greek religion, your father is the priest of the household cult of your own ancestors and the household deities (the lares in Latin). This goes a bit further than the Commandment "Honor thy father and thy mother" [Exodus 20:12], although even there we also get "Whoever strikes his father or his mother shall be put to death" [Exodus 21:15], which bespeaks the gravity of the relationship. Indeed, in Roman law, the pater familias had the power of life and death over members of his family, and nothing like mere adulthood freed children from his authority. Euthyphro would not get anywhere with Confucius, any more than with Socrates. Indeed, to the Greeks, the sin against Euthyphro's father could call down the divine vengeance of the (or ), the Furies, such as pursued Orestes for killing his mother and that plagued Thebes because Oedipus had killed his father and married his mother. Apart from the falsehood of his general thesis about Socrates, this is perhaps the worst mistake Burnyeat makes in his entire paper. Burnyeat fails to understand a key element in Greek religion. Piety is an issue in the Euthyphro because of Euthyphro's own act of impiety. This hangs like a pall over the entire dialogue; and we end with Socrates, in his own way, sternly rebuking Euthyphro -- at 15d, which I have just quoted above. Euthyphro wishes to abridge the duty of respect of sons for their fathers with a weightier consideration, the injustice of murder. Whether the murderer is your father or any other relative, "the pollution is the same," [4c, a nice touch that the Greek word here for pollution is "miasma"]. Since Socrates cannot disagree that murder is wrong, this does raise a real question, as with Confucius, how filial piety ( ) is to be reconciled with righteousness ( ). The Euthyphro never does really address this question, since Socrates chooses to focus on the meaning of "piety" itself. Yet we cannot mistake the feature of filial piety involved, otherwise Socrates would not have said, "Is then the man your father killed one of your relatives? Or is that obvious, for you would not prosecute your father for the murder of a stranger" [4b; Glube, p.8]. We might even say much the same thing, but then with us it would not be an issue of piety, i.e. religious duties. Burnyeat therefore misses the central issue of the Euthyphro. What he does focus on is the issue that Socrates highlights with his questioning, namely the disagreements of the gods. It looks like Burnyeat wants it to be a virtue of traditional Greek religion that the gods disagree on moral issues. But Euthyphro himself provides no support on this, since he does not wish to admit that the gods actually do disagree on moral issues, saying, "I think, Socrates, on this subject no gods would differ from one another, that whoever has killed anyone unjustly should pay the penalty" [8b; Grube, p.12]. He may be confused about this, given the mythology he invokes, as Socrates discovers, but the way he would like things to be is clear enough -- he wants to agree with Socrates about the justice of the gods, while retaining an incoherent regard for the mythology. And so, perhaps misunderstanding Euthyphro's own principles, Burnyeat proceeds to the danger that Socrates poses to Greek religion, because "piety becomes a moral quality prior to and independent of divine pleasure or displeasure" [p.9]. Of course, this principle was already evident in Xenophanes; and it is not clear that Burnyeat would countenance the logical opposite, namely the principle of Qur'ân 3:40, , Allâhu yaf'alu mâ yashâ'u," "God does what he wishes." But he does say, "This is fatal. Why have many gods if they think and act as one?" [ibid.]. Now, I believe that the moral critique of the Greek philosophers was indeed fatal to traditional Greek religion, but Burnyeat could easily ask his question of the last pagan philosophers, the Neoplatonists (whom Burnyeat never mentions), who had no difficulty preserving all the traditional gods, with an ultimate One presiding over them and all Being. Nevertheless, I say "fatal" because the religion of the Neoplatonists never had any hold on the masses, and consequently we might think that it was incapable of such a hold. That would be a mistake. Something that looks much like the religion of the Neoplatonists, and that is going right now as strongly as ever, is modern Hinduism, which has never discarded any traditional gods but which nevertheless has a Surpreme Being at the top of the ontological pyramid, whose character ranges, depending on who you ask, from an impersonal One as in Neoplatonism to alternative devotionalistic Gods. What may have made a difference in Indian religion is that various critiques began within the religion, in the Upanishads, and without the interest in natural philosophy with which Greek philosophy began -- and that gave the philosophers a reputation for atheism. This is a very strange statement. One might as well say that without the institution of slavery Greek culture (or any other historical culture for that matter) would have been impossible -- at least in the form that we see it -- and that Western civilization (or any other) would not be what it is today. This cannot be an argument against the abolition of slavery, nor can it be a criticism of the moral critique of slavery that led to its abolition. "Singlemindedly moral" Abolitionists never would have allowed slavery in the first place, but then it took a while, a long while, for a moral critique of slavery to gain any traction. Similarly with the Greek moral critique, similar in many ways to the Hebrew and the Zoroastrian, of religion. Western civilization is what it is today, of course, because the critique of Greek religion from the philosophers led to the growth and adoption of new religions, specifically the monotheistic religions derived from the Judaism that resulted from the noted Hebrew critique and rejection of the religions, like those of the Egyptians, Phoenicians, and Babylonians, that surrounded or confronted the religion of the Israelites. It is not like M.F. Burnyeat is going to believe in the Greek gods. Whether he accepts the legitimacy of the moral critique of Greek religion or not -- and perhaps he is a Nietzschean exulting in the immorality of the gods, for all we know -- he is not, as a modern person, and perhaps even as an atheist and a materialist, going to accept the existence of any such supernatural beings. That was accomplished through the science begun by the natural philosophers whose theories Socrates himself rejected -- but, as we have seen, Burnyeat may want to imply that Socrates accepted them also. So it is all a bit silly. The critique of religion by science would tend to lead to no religion, while the distinctive thing about the Greek moral critique of religion is that, in Western history, it led to new religions, namely Judaism, Christianity, and Islam. Perhaps that is actually Burnyeat's objection -- not to Socrates, but to these other religions. One begins to wonder if Vlastos has noticed the many centuries of history in which two things happened -- one that all the Classical gods were rationalized, domesticated, and moralized by the Epicureans, Stoics, Neoplatonists, etc. ; and that the actual "destruction of the old gods" was effectively accomplished through the triumph of new religions. As with Burnyeat, we might wonder what Vlastos expects to have happened. Without Xenophanes, Heraclitus, Socrates, or Plato what? The old religion would have gone on as before? What would "Western civilization" have looked like in that case? Like India? Indeed, this whole line of thought in Burnyeat and Vlastos is bizarre. If Greek culture had begun without immoral gods or slavery, it certainly would have been very different. This, however, is a counter-factual that cannot have been instituted by any critique of Socrates, or by the dismay of Burnyeat or Vlastos, while their shock and discomfit appears equal about what did happen, that the critique of Greek religion did have a historic effect on that religion. It is not that they worry that Socrates would have made Greek civilization (counter-factually) different from what it was, but that he, and Xenophanes, Heraclitus, Plato, etc., (factually) did. But Burnyeat and Vlastos overlook something else. There was change within Greek religion itself. Sophocles, Fragment 837, "Fragments Not Assignable to Any Play," Sophocles III, Fragments, Loeb Classical Library, Harvard University Press, 1996, 2003, pp.368-369; regarding the Eleusinian Mysteries; translation modified. The gods of Eleusis were not like the gods of the Iliad and the Odyssey. Instead of the shades of the dead going down to the miserable half-existence in Hades, where Achilles poignantly and tragically tells Odysseus that he would rather be anybody just to be alive, we get a promise of rebirth and eternal life. Now, where would Socrates have been "told," ("the [things] said"), any such thing? At Athens, especially, the answer is obvious: The Eleusinian Mysteries -- what the Homeric "Hymn to Demeter" called the and (remember ? ), "mysteries beautiful" and "awesome." And why would Socrates not say so? Why this suspicious and perhaps damning "silence" about who told him this? Well, I expect he couldn't say who told him. We know that there were riots, no less, and prosecutions associated with anyone thought to be divulging secrets of the Eleusinian Mysteries. Indeed, if Socrates was an initiate of the Mysteries, which here seems likely, it may be the place where he learned the very reticence about religion, mentioned in the "Hymn to Demeter" epigraph above, that we see in him avoiding the names of Apollo and Achilles. Perhaps Xenophon was not an initiate and so may have been less likely to have these scruples about using the names of the gods freely. The paradox of the promise of the Eleusinian Mysterties is that it denatures the Greek gods, much as Burnyeat accuses Socrates of doing. For, what is characteristic of the gods in the epics is that they are "happy" and "deathless." But now, at Eleusis, all the dead can also be happy (or at least "happier") and deathless. So how are the gods going to be any different? Socrates helpfully supplies a difference. His gods are now good and wise, while no humans, not even the dead, are going to be thus. So, after a fashion, Socrates comes to the rescue of Greek religion, not in the most traditional sense only seen by Burnyeat, but the religion as it had evolved at Eleusis (by way of Orphism and other phenomena), which resulted in this paradox about the gods. Consequently, not only does Burnyeat demonstrate his ignorance of the nature of filial piety in Greek religion, both he and Vlastos overlook a sea change in Greek religion that owes nothing to Socrates or any philosopher. Socrates follows, rather than originates, innovations in religion -- innovations that lead directly and obviously to the Hellenistic Mystery cults and to the Christianity for which Burnyeat, as the modern bien pensant academic, holds an ill concealed disdain. Socrates throws in his two cents, but the tide undoubtedly would have gone on without him. So, having ignored all these features of the Apology and its situation, what is Burnyeat's problem? It looks like he doesn't want us to value Socrates as a martyr for free speech ( , or ) or freedom of religion [p.11]; for the kind of religion that grew out of the critique of Socrates "proved even less tolerant than the old" [p.10]. Salman Rushdie is trotted out by Burnyeat to confront Socrates, or Plato, or both. That is quite a burden to put on an old man in the business of provoking a jury. And yet if we cannot, indeed, imagine Socrates doing his thing in Sparta, or Mediaeval Europe, or Mediaeval Islam, or Soviet Russia, or Modern Iran, or the politically correct American University, then we should truly have no difficulty retaining Socrates as a martyr for free speech and freedom of religion. At the same time, the tolerance of the traditional pagan religion often seems a function of its lack of organization and doctrine. When push came to shove, it could be pretty intolerant itself, not just in the execution of Socrates, but in the later, far larger, and sanguinary persecutions visited on early Christianity. It might be said that Christianity got its revenge, but then we could at least say that the likes of Decius or Diocletian had started it. Tolerance based directly on liberty of conscience is something that would have to wait nearly as long as the moral critique of slavery. We see the essence of M.F. Burnyeat's problem in the last line of the article: "If we can get political power, we will make this new religion compulsory for all -- especially the poets" [p.12]. This is, of course, a swipe at Plato, who, bracketing the historical Socrates (sort of) as Burnyeat does, is responsible for the whole business -- and, evidently, then responsible for the Emperor Justinian, who actually did make Christianity "compulsory" for all Romans. But if Burnyeat means Christianity, why doesn't he tell us how he really feels? Just come out once and scream it (as Bob Dylan would say)? An academic audience that despises Christians more than Islamic Terrorists is not going to object. So perhaps there is a bit of dissembling here, and Burnyeat may conceal his true commitments as much as he accuses Plato's Socrates of doing. The Apology does not present Socrates as guilty of atheism, or introducing strange gods, or anything; but perhaps Burnyeat's treatment proves him guilty of the charge voiced by Meletus himself ( ), but curiously ignored by Burnyeat. 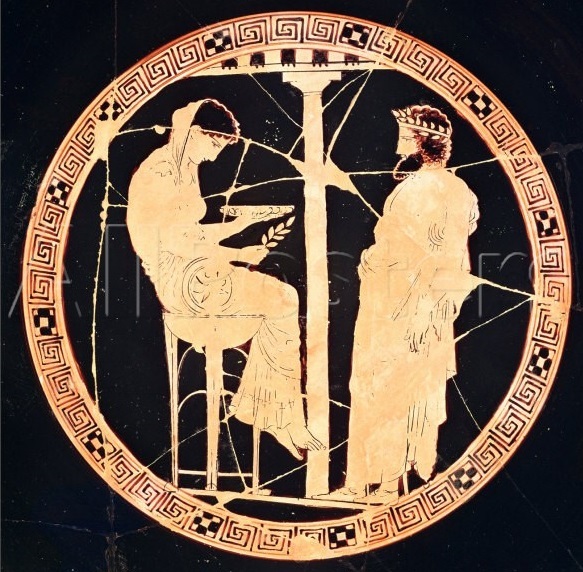 Euripides is supposed to have died in exile in Macedonia; but it is not clear whether he went there because he felt unwelcome at Athens or because of an attractive offer from the King of Macedon, Archelaus, known as "Philhellene," , or whether he even intended to stay. Here we have a double critique of traditional religion. It is not clear, in the first instance, whether Heraclitus objects to all blood sacrifice, or to specific rites of purification involving blood sacrifice. If the principle is just that blood is polluting, not purifying, then it is all sacrifice; and in the long run, of course, blood sacrifice in general was abolished by the Emperor Constantine, and the attempt to revive it by the Emperor Julian was dead on arrival, even farcical. Today, extraordinary rituals like the Roman taurobolium, where the initiate stood in a pit and bathed in the blood flowing from the freshly cut throat of a sacrificial bull, seem outlandish and even pornographic enough to end up reenacted on HBO. Actually, it is not clear exactly who performed this ritual, since the term taurobolium, , can mean any sacrifice of a bull, and is thus applied to the central mythic, cosmogonic act of the god Mithras -- but it is not clear that the mystery religion Mithraism included bull sacrifice in its own ritual, let alone the full extravagance of the sanguinary taurobolium. 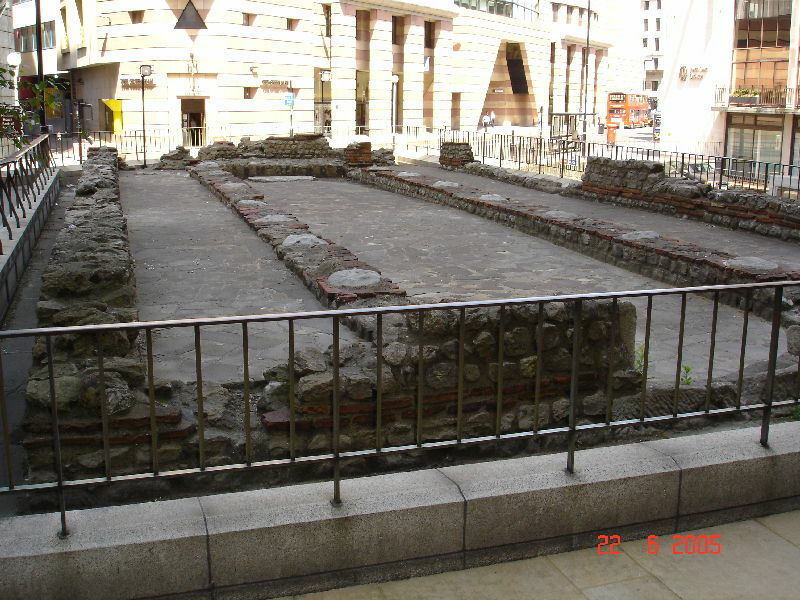 The many Mithraic sites, the Mithraea (singular, Mithraeum), including one discovered in the City of London (see below), do not have the arrangements that would really be necessary for any kind of taurobolium, whether sacrifice or blood bath, which, given the size of bulls, requires at the very least some considerable space, whatever one is going to do to them. 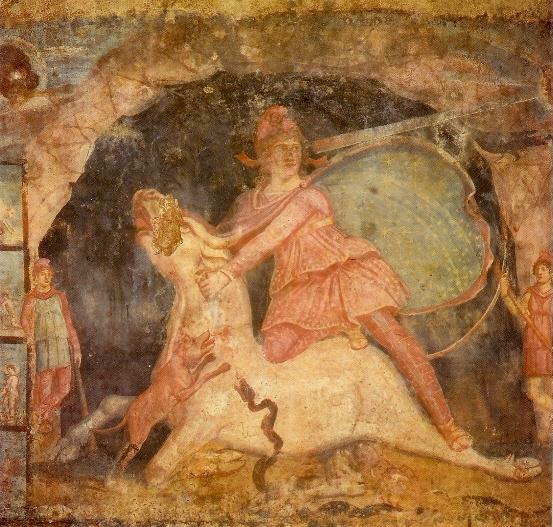 As we see, the London Mithraeum seems less commodious than a typical English parish church, with no evidence of a pit. The scale of the burial of the Apis bulls at the Serapeum of Memphis gives one a good idea of what is involved. Actually, the full taurobolium is poorly attested, attributed to the cult of the Phrygian goddess Cybele (the Magna Mater) by a single 4th century Christian apologist. So doubt exists whether the rite was actually ever performed as described. The HBO version, however, with a naked actress showered in blood, may be too good to disbelieve. Indeed, the introduction of this goddess to Rome was regarded by James G. Frazer as a key step in a process of decadence that "undermined the whole fabric of ancient civilization." In other words, Heraclitus is no fun; and we can have no difficulty imagining his response to what is clearly a modern continuation of ancient taurobolia, the Spanish corrida de toros, the Bull Fight, which ends with the death, if not the sacrifice, of a bull. The second point of Heraclitus cuts even deeper, as it were, into ancient religion. If statues, , i.e. idols, are not to be used in religion, the focus of the cult of any ancient temple is removed. If Socrates had run around saying things like this, anyone might say he was intent on overthrowing the practice of Athenian religion. Yet this had already happened, of course, in Judaism; and the principle would become quite universal in later religion. The exception of the use of statues in Catholicism for saints, Jesus, Mary, etc., is hedged with careful qualifications that these representations are not deities themselves and are not to be treated in ways suggesting such. Most of this was rejected in the Iconclasm Controversy in the 8th and 9th centuries (730-787, 815-843 AD), with the Orthodox Churches accepting a compromise of flat icons; but Iconoclasm was revived in its full rigor by Protestantism, to the tragic loss of a great deal of European religious art. Heraclitus himself, of course, was well known for an obscure and oracular way of speaking; so he may well have seen the god at Delphi as a kindred spirit. Socrates in turn relies on an ambiguous "sign" from Delphi as the key to his whole life. In one of the most venerable translations of the Apology, Benjamin Jowett (1817-1893) renders as "other new divinities of his own." So the wrong idea about this goes way back. Other translations of the Apology I have at hand are the Penguin edition, translated by Hugh Tredennick [Plato, The Last Day of Socrates, Euthyphro, The Apology, Crito, Phaedo, 1954, 1966] and a Mentor Classic, translated by W.H.D. Rouse [Great Dialogues of Plato, The New American Library, 1956]. For Tredennick gives us "deities of his own invention" [p.54]. Rouse has "other new spiritual things" [p.430]. Snap. So between Burnyeat, the Loeb edition, Grube, Jowett, Tredennick, and Rouse, Rouse is the one who wins the prize. Only he has translated as an adjective with a neuter sense, supplying a noun in this vein, "things," such as is required by English grammar -- where we can't have a noun phrase without a noun. As it happens, Grube's translation of the Apology was later revised by John M. Cooper for a 2002 edition of the Hackett text. Although I don't like all of Cooper's revisions, he now renders as "new spiritual things" [p.28]. This is progress. The surprising thing is that so many translators for so long kept doing it wrong. Unfortunately, Myles Burnyeat had not gotten the memo. This grammatical rule in English sometimes has curious consequences. Thus, an evil person is much worse that a bad person. But if bad things happen, they are not "bads" -- in traditional usage (where "my bad" is ungrammatical) -- but "evils." For "bad" is only an adjective, while "evil" is both an adjective and a noun. So "evil" loses some of its evilness when pressed into service as a noun. Like Greek, other languages, such as Arabic, can have noun phrases with adjectives but no nouns. Further discussion of translating occurs in the review of Euripides & the Gods, by Mary Lefkowitz, who ill advisedly supports Burnyeat, his translation, and his thesis. However, some points of that discussion warrant notice here. One problem with translations like that of Burnyeat, Jowett, etc. is that, if Socrates is to be accused of introducing new gods, , why doesn't the indictment just say that? It is the word that Socrates uses when telling Euthyphro about the indictment against him. But that is not the word in the actual indictment. Instead, it says , which, even if we take to be used as a noun, and to represent some kind of beings, it is still considerably weaker than ; and we might even question whether it is ever appropriately to be translated "divinities," rather than just "spirits." After all, Socrates gets Meletus to admit that the word implies , not (directly) . Liddell & Scott gloss , the singular adjective, used as a noun, as "an inferior divine being, a demon," as used by Xenophon and Plato, or as equivalent to the abstract Latin numen, "divine operation." But if Burnyeat wants Socrates to mean by his expression "the god," which he uses a lot, a sort of proto-Christian Diety, and definitely not "an inferior divine being," why doesn't Socrates, besides using , use the stronger adjectival expression , which Liddell & Scott gloss as "the Divine Being, the Divinity, Deity," as used by Herodotus and Aeschylus. If Socrates is introducing "other new divinities," this would most naturally be expressed as . So not only do the translators make an unwarranted jump by translating as a noun rather than an adjective (ignoring the context), but they make another jump by translating it as "divinities" rather than "spirits." "Divinities" is two semantic steps away from the appropriate "spiritual." There is an important passage in the Apology where Socrates uses both the words and . This is at 31d, which says , hoti moi theion ti kai daimonion gignetai, i.e. "that something divine and spiritual comes to me," which is exactly how the Loeb edition translates it. Two things about the text: (1) why would daimonion be used as a noun but not theion? Why not "spiritual divinity" instead? And (2) if daimonion is used as a noun, and theion as an adjective, then kai, "and," is unnecessary, since there is an attributive rather than a conjunctive relation between the words. My impression of Greek, as of English, is that "and" (kai or te kai, etc.) is used for two nouns or two adjectives, but not with a mixture. It's unnecessary. But in this passage it is clear that neither word is used as a noun, because what comes to Socrates, of course, is his "sign," , which, being neuter, has the adjectives agree with it. So words that we might be tempted to translate "divinity," "spirit," or "god," which we could be prepared to do by the muddle effected by the translators, cannot mean that. Socrates never says that the god comes to him, as the angel appears to Joseph Smith, only that the sign, the voice, comes to him. Actually, Dionysius is also a god worshiped at Delphi. So perhaps "the god" could mean him. However, Dionysius is in turn a god worshiped at Athens -- the theatrical festival and its amphitheater are named after him -- so it would not help Burnyeat's case if Socrates were meaning Dionysius instead of Apollo. No, Burnyeat needs for "the god" to mean some deity previously alien to Greek religion and unknown at Athens. The context here is the reference of a servant to the goddess Aphrodite, whom Hippolytus has offended as the play began. He asks the servant whom he means but warns him not to name the goddess [line 100]. The servant indicates an actual statue of Aphrodite by Hippolytus' own gate [line 101]. Historically, in China and Japan, the personal name of an Emperor is not used after he assumes the Throne. Instead, as this is now expressed in Japanese, a reigning Emperor is simply Tennô Heika, , the "Present Emperor" or his "Majesty the Emperor." The expression , "below the steps," in Chinese originally meant the Emperor's Ministers, who were addressed by petitioners rather than the Emperor directly. A reference even further removed from the person of the Emperor in Japan is Mikado, , or "Honorable/Imperial Gate," with the Gate of the palace as the venue for petitioning the Emperor -- parallel to the "Sublime Porte," , Bâb-ï-'Âlî, for the Government of Ottoman Turkey. In all of these, the numinous character of the ruler is separated, physically and linguistically, from ordinary persons. While the exalted status of the Chinese Emperor was as the "Son of Heaven," , the Japanese Emperor, until after World War II was actually a god, a kami, . Personal names of Emperors were also not used after their deaths. In Chinese, different posthumous names were used, for differing historical or religious purposes. In Japan, the charming tradition developed of referring to Emperors by places in Kyôto that were associated with them, e.g. the Ichijô, or "First Avenue," Emperor (986-1011 AD). China of the Ming and the Ch'ing began using Era names as postumous names. Meiji Japan adopted this practice, so that the Emperor whose personal name had been Hirohito (1926-1989) became the "Shôwa Emperor" at his death. Persons only casually familiar with Japan may be unaware of the personal name of the Meiji Emperor himself. Avoiding the names of the dead is a practice that has extended far beyond these venues. We might reflect that it involves fear of attracting unwanted spirits. When offerings are made for the dead, as still in China, the names of the dead will be invoked, to call them, but then there is some ritual care taken that they will depart afterwards. Similarly, in Egypt, the dead were named at their own tombs, as part of ritual offerings, with inscriptions also often pleading with passersby to call on the dead and thereby help give them life. Other cultures might regard this practice as dangerous, since the attention of the dead may be something never to attract. We don't find quite this worry among the Egyptians. We are accustomed to the idea that personal names may be too familiar in formal contexts. With divine or sem-divine rulers, however, no familiarity may be allowed, and various phenomena, apart from indirect address, may attend their status. Thus, we see that the King of Egypt, who may be referred to as , the "Good God," or "Pharaoh," along with other formulae, is too sacred even to be touched without harm. Similarly, the Emperor of Japan was not supposed to be looked at directly, even as a certain level of sacred nobility in Hawai'i were not supposed to be looked at, at all, by commoners, on pain of death. Even as these prohibitions attend their sacred status, it is not surprising that similar prohibitions apply where the problem is pollution rather than holiness, as we see in the Untouchable and Unseeable Castes of traditional India. Thus, the reluctance of Socrates to name his god Apollo, or his hero Achilles, is part of a universal phenomenon of religion; and Burnyeat has committed a grave oversight and distortion by trying to make an issue of it with Socrates. In trying to get Dr. Watson to reason the same way that he does, Sherlock Holmes would say, "You know my methods." Myles Burnyeat, however, does not seem to know the methods of Socrates. Burnyeat says, "Socrates' divinity lays down that the accepted values of the Athenian community are to be put in question." However, when Socratic Method is to solicit what people believe themselves, then all he can and will do is question the beliefs in terms of their own internal coherence. This may "put into question" some of what his interlocutors have been telling Socrates, but this can be challenged only in terms of something else that the person believes. What the "values of the Athenian community" may be is something about which Socrates does not inquire. But Burnyeat does not seem to see Socrates as a nihilist, something that would be difficult to reconcile with this passage. Instead, Burnyeat may think of Socrates and Plato as introducing a strange, perhaps proto-Christian ideology, in the company of their new, heterodox divinities -- who may be those gods giving us good things. But this would be difficult to do given the Method of Socrates. He is on no soapbox at Hyde Park Corner expounding the New Covenant. People might hear a lot from Socrates without ever gathering what he actually believed. Hence the exceptional revelations of the Apology. But Burnyeat does not just rely on the Apology. He offers Euthyphro as a proper example, as it should be, of Socrates in action. But, as we shall see, Socrates does not tell Euthyphro what to do, except in the most indirect fashion. And his examination of Euthyphro begins with the problem of the impiety of Euthyphro prosecuting his father for murder. Burnyeat completely misunderstands and misrepresents the issue, as we shall see shortly in the main text. It is hard to read this and imagine that it is contrary to "the accepted values of the Athenian community," either questioning or impeaching them. Does Burnyeat really want to make the argument that the values of Athens place wealth and the body above virtue and what is best -- -- for the soul? But Burnyeat gets nowhere so specific. What's more, does Burnyeat himself, who apparently has "issues" with Socrates and Plato, place wealth and the body above virtue and the soul? This would not be all that surprising in modern life, to find such a thing. Does the "young urban professional" -- the "yuppie" -- care about virtue or the soul? Was Athens a city of yuppies? With mean old Socrates raining on the parade? We might wonder.